Josh is growing bell peppers on the deck for the first time ever and they are coming in quite nicely, as evidenced by the photo below of the biggest pepper we’ve got going so far. 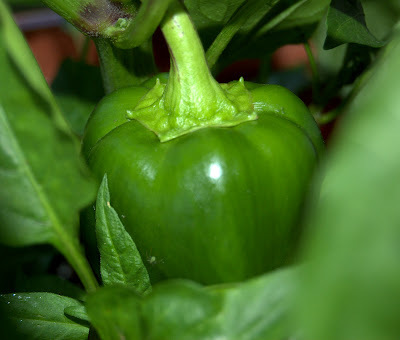 So in preparation for the deliciousness to come, I thought I’d post a few of my favorite recipes for utilizing bell peppers…. This entry was posted in General Musings and tagged local, vegetables on July 19, 2009 by Lauren.